Find videos of presentations from NCSBN conferences in the Events section. 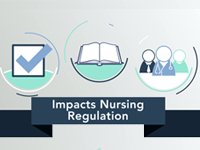 Most of NCSBN's educational video productions are designed to provide clarity to nurses, nursing students and others about some of the most challenging issues nursing regulatory bodies (NRBs) face in their mission to protect the public. NCSBN is currently in production on several other videos, so check back here for new releases. 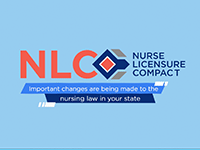 The Enhanced Nurse Licensure Compact (eNLC) increases access to care while maintaining public protection at the state level. 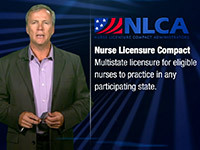 This video explains what nurses, employers and educators in original NLC states need to know as their state joins the enhanced compact. Employers may utilize the video for educating nurses in their organization. If your state is part of the eNLC and not part of the original compact, view the version for new states. NCSBN develops two licensure examinations, the NCLEX-PN and the NCLEX-RN, that are used by nursing regulatory bodies to assist in making licensure decisions. 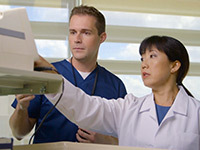 The exam uses computer adaptive testing (CAT) to measure the competencies needed to perform safely and effectively as a newly licensed, entry-level nurse. CAT is a method for administering exams that merges computer technology with modern measurement theory to increase the efficiency of the exam process. This video explains why CAT is used for NCLEX and how it works. Topics covered include item selection and pass/fail rules. Find out more about the exam and CAT. If all states adopt the requirements for the regulation of Advanced Practice Registered Nurses (APRNs), as outlined in the Consensus Model for APRN regulation, the benefits will be far-reaching for consumers and health care workers. Consumers will better understand who an APRN is, what an APRN does and be confident that APRNs are consistently regulated from state to state for public protection. Current and future APRNs will have confidence in knowing that they don't have to meet different licensure requirements for difference states and that their education program is accredited and preparing them appropriately for certification and licensure into their advanced role. 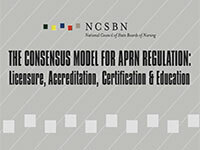 This short-length video version provides a succinct overview of the APRN Consensus Model. If all states adopt the requirements for the regulation of Advanced Practice Registered Nurses (APRNs), as outlined in the Consensus Model for APRN regulation, the benefits will be far-reaching for consumers and health care workers. Consumers will better understand who an APRN is, what an APRN does and be confident that APRNs are consistently regulated from state to state for public protection. Current and future APRNs will have confidence in knowing that they don't have to meet different licensure requirements for difference states and that their education program is accredited and preparing them appropriately for certification and licensure into their advanced role. 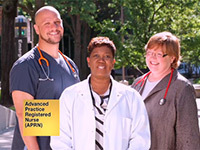 This full-length video describes the consensus model in-depth and shows the four different APRN roles in action. 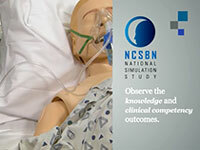 Learn more about NCSBN's landmark, national, multi-site, longitudinal study of simulation use in prelicensure nursing programs throughout the country. The study will begin Fall 2011 and will follow beginning nursing students from 10 participating schools throughout their nursing education. 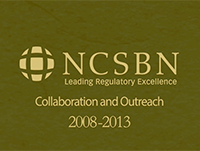 Promotional videos are available to learn more about NCSBN and NRBs. 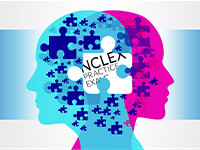 The new NCLEX Practice Exam is the missing piece to help you prepare for exam day. It is timed and uses actual retired NCLEX items to give you a simulated exam experience. 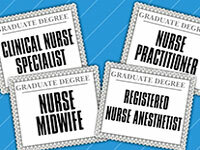 Learn more at nclex.com. e-Notify for nurses is a free of charge innovative nurse licensure notification system. The system helps nurses track their license and discipline statuses and provides license renewal reminders. The information is provided as it is entered into the Nursys database by participating nursing regulatory bodies. 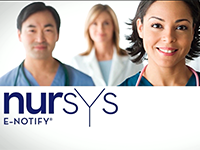 Learn more about Nursys and e-Notify for nurses. The NCSBN Regulatory Atlas is the first comprehensive resource of nursing regulation around the world. It provides regulatory information for countries around the world, including licensure requirements, levels of nursing and mandatory education. Explore the NCSBN Regulatory Atlas at regulatoryatlas.com. e-Notify for institutions is an innovative nurse licensure notification system that delivers real-time notifications to employers about nurses in their employ. 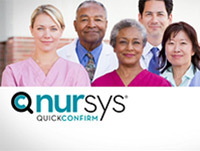 The system provides licensure and publicly available discipline data directly as the information is entered into the Nursys database by participating nursing regulatory bodies. 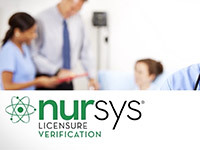 Learn more about Nursys and nurse license verification. Licensure QuickConfirm is a free service that allows employers and recruiters to retrieve licensure and any applicable discipline documentation in one convenient location. Celebrating its 40th anniversary, NCSBN has created a new logo that builds upon the foundation of its previous one. The five squares are brought together to depict interconnectedness and then expanded to suggest a spherical shape of a globe. The square elements combined form a pattern signifying of collaboration between members and national and international peer organizations. The linear space between the elements connects them together creating a networking web extending around the globe. The whole design conveys the expanding influence of NCSBN as an international organization that is leading regulation excellence around the world. 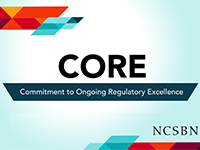 The NCSBN Center for Regulatory Excellence awards grants of up to $300,000 for scientific research projects that advance the science of nursing policy and regulation and build regulatory expertise worldwide. This video provides potential recipients an overview of the application requirements and helpful tips for putting together a successful grant application. Learn about the Center for Regulatory Excellence grant program in this overview video. Get additional details about CRE. Participating in the four-year IRE Fellowship program helps nursing regulators gain new knowledge and improve their leadership skills. Learn how you can apply for the program. 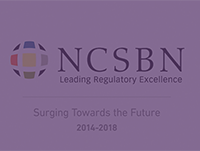 For more than 30 years, NCSBN has served as a leader in nursing regulation. NCSBN is the vehicle through which nursing regulatory bodies act and counsel together on matters of common interest and concern affecting public health, safety and welfare. This video provides a brief history of NCSBN and explains what the organization does and how it achieves its mission of public protection. This commercial, as seen on CBS affiliates, educates consumers about the role of advanced practice registered nurses in health care. 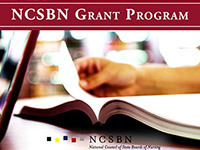 It was created from a collaboration between NCSBN and the CBS Community Partnership Program. This commercial spot, as seen on CBS affiliates, educates consumers and promotes the work of boards of nursing. This was created from a partnership between NCSBN and the CBS Community Partnership Program. 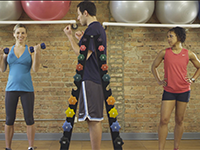 Private videos are available to NCSBN Members to learn more about NCSBN products and services. Current NCSBN leaders and committee members talk about how participating in NCSBN activities has benefited them both personally and professionally. 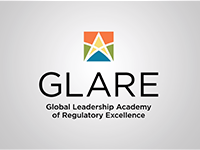 Later this year, NCSBN will launch the Global Leadership Academy of Regulatory Excellence (GLARE). 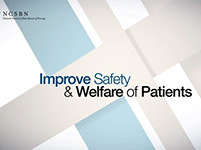 In this video, staff working on the new program talk about what GLARE is and how it will benefit nursing regulation. 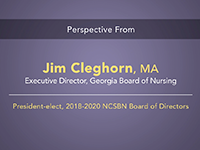 NCSBN President-elect, Jim Cleghorn, talks about how participating in NCSBN activities has benefited him both personally and professionally. 2019 Model Acts & Rules Committee member, Linda Kmtez, talks about how participating in NCSBN activities has benefited her both personally and professionally. 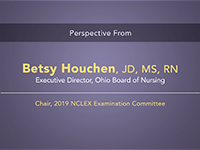 2019 NCLEX Examination Committee Chair, Betsy Houchen, talks about how participating in NCSBN activities has benefited her both personally and professionally. 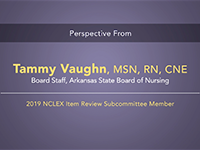 2019 NCLEX Item Review Subcommittee member, Tammy Vaughn, talks about how participating in NCSBN activities has benefited her both personally and professionally. 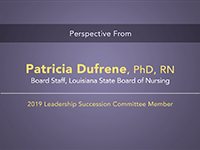 2019 Leadership Succession Committee member, Patrica Dufrene, talks about how participating in NCSBN activities has benefited her both personally and professionally. 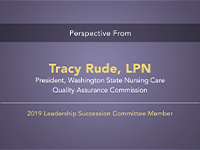 2019 Leadership Succession Committee member, Tracy Rude, talks about how participating in NCSBN activities has benefited her both personally and professionally. 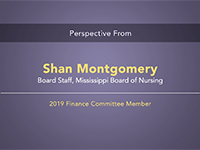 2019 Finance Committee member, Shan Montgomery, talks about how participating in NCSBN activities has benefited her both personally and professionally. 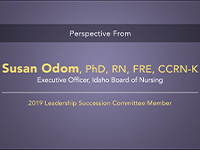 2019 Leadership Succession Committee member, Susan Odom, talks about how participating in NCSBN activities has benefited her both personally and professionally. 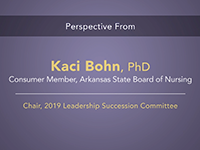 The Chair of the 2019 Leadership Succession Committee, Kaci Bohn, talks about how participating in NCSBN activities has benefited her both personally and professionally. 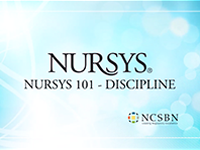 Nursys 101 - Discipline demonstrates how to add discipline to a license. Also learn the steps for editing, revising and deleting discipline cases. 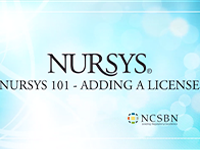 Nursys 101 - Adding a License demonstrates how to create a new license in Nursys for adding discipline. 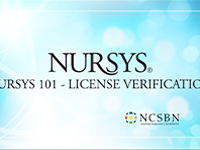 Nursys 101 - License Verification demonstrates an overview of the license verification process including how to track and acknowledge a verification in Nursys. 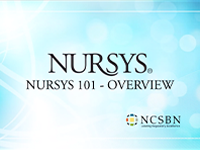 Nursys 101 - Speed Memo demonstrates how nursing regulatory bodies may securely and quickly communicate about nurse license information using the speed memo feature of Nursys. 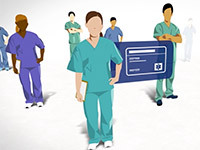 An authorized Nursys user will be able to communicate with staff in other jurisdictions that share the same license or discipline responsibilities to facilitate communication about data in Nursys. This video highlights the speed memo categories and how to direct your speed memo to another jurisdiction. The video also demonstrates how to search and filter the speed memos and to delete speed memos from the inbox or sent box. 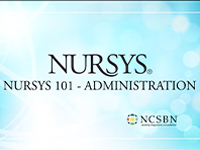 Nursys 101 - Overview explains the purpose of the nursys.org website for U.S. Members and how the website is organized for an authorized user to access information on an individual nurse for the purpose of license verification, discipline and reporting. 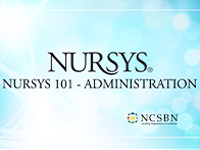 Nursys 101 - Administrator provides instructions on how a Nursys administrator can manage their users and their user's permissions from within Nursys. 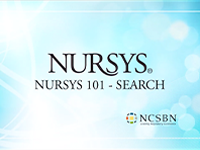 Nursys 101 - Search demonstrates how to locate a nurse in the Nursys database. The search features, quick search and searching from the menu are detailed. Searching tips are also provided. 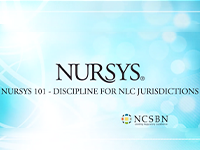 Nursys 101 - Discipline for NLC Jurisdictions highlights features that support the discipline entry process, which apply to the Nurse Licensure Compact states. Entering Privilege to Practice and apply/extend PTP are detailed with an explanation and demonstration of linked discipline cases. This video shows how members can use the CORE Portal to compare performance metrics and create customizable reports. Recorded at the 2018 NCSBN Annual Meeting, this video covers everything delegates must know to effectively represent their nursing regulatory body at the NCSBN Delegate Assembly. This video explores how Nursys.com allows members of the public to view licensure information from the Nursys database. 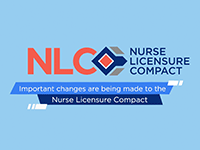 New features provide the public with a better understanding of where a nurse can practice as the Enhanced Nurse Licensure Compact (eNLC) is implemented. 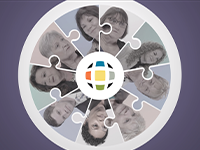 This video explores how your nursing regulatory body (NRB) can use Nursys.org to collaborate and communicate securely and efficiently with other eNLC NRBs on issues related to the eNLC. Information that is uploaded to the Nursys® and NPDB databases can be used in both strategic and operational performance assessment and improvement. 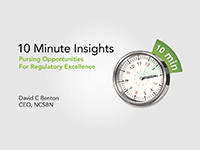 This video is part of NCSBN's 10 Minute Insight series meant to augment papers published in the Journal of Nursing Regulation and help nursing regulatory bodies maintain or improve their performance. NCSBN offers programs and resources that help members advance their leadership potential. These programs help make you more valuable to your community and your workplace and prepare you for continued success. 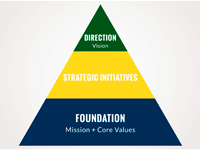 The NCSBN strategic plan provides a way of focusing and prioritizing objectives as the organization moves forward. 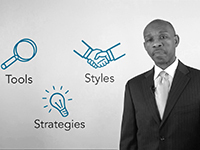 This animation summarizes the strategic initiatives and how they relate to NCSBN’s vision, mission and values. Increasing your involvement in NCSBN benefits you both personally and professionally. In this video, members who have become influential leaders within the organization discuss the benefits of participating in NCSBN activities and how you can become more involved. Hive is a space for committees and knowledge networks to easily collaborate and participate in dynamic discussions on topics important to you and nursing regulation. Administrator provides instructions on how to create and print custom or complete reports from the Member Board Profiles application. 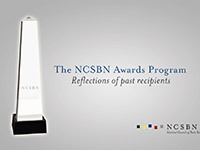 In honor and celebration of NCSBN’s 35th Anniversary, videos of past award recipients were recorded to capture NCSBN’s 35 years of recognizing members for excellence in nursing regulation. Recipients share their reflections of what it meant to them and the impact it had on their work in regulation. In this video, we'll show you the ins and outs of creating a new user within Passport. We'll start by signing to Passport as the Passport Admin, navigate through the Administrator Control Panel, and then cover the easy steps for completing a new user registration. 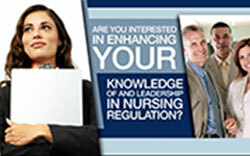 For more than 30 years, NCSBN has served as a leader in nursing regulation. NCSBN is the vehicle through which nursing regulatory bodies act and counsel together on matters of common interest and concern affecting public health, safety and welfare. 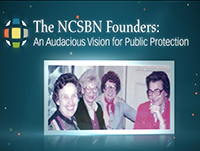 This video provides a brief history of NCSBN and explains what the organization does and how it achieves its mission of public protection. It also discusses important information about safety and security inside NCSBN’s Chicago office. 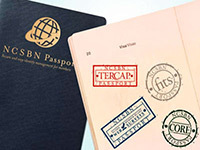 Passport is an innovative tool that promises to make online interactions with NCSBN easier for members. It is designed to provide convenient access to all NCSBN websites and applications. This video will show you how Passport makes life easier for NCSBN members. As NCSBN celebrates its 40th anniversary, we look back at the inspiring women who founded the organization. 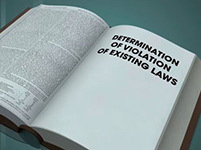 As the body of nursing regulation knowledge becomes more expansive, NCSBN relies on evidence that is rooted in theory and based on research to assist in making regulatory decisions. 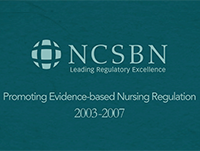 NCSBN embraced the challenges and opportunities of evidence-based nursing regulation. NCSBN had its eye on the future as it began researching the use of computer adaptive testing for the NCLEX. 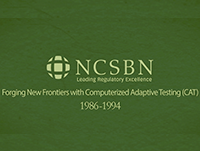 It took several years of research and hard work by dedicated professionals, but in 1994, NCSBN became the first health care organization to utilize computerized adaptive testing for the purpose of licensure. 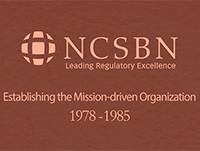 The first several years of NCSBN's existence focused on establishing a mission-driven organization that was rooted in public protection and strengthening the role of nursing regulatory bodies in nursing regulation. Health care has become increasingly global in scope. NCSBN saw this evolution as an opportunity to grow and collaborate reaching new, diverse audiences both nationally and internationally, as the organization continued its mission of public safety. Emerging technologies were changing the world as the beginning of the 21st century approached. 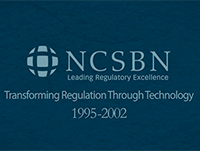 NCSBN welcomed new technological tools, resources and mediums that forever changed the trajectory of nursing regulation. Kathy Apple led NCSBN during a time of unprecedented change and growth for the organization. Her 14-year tenure as CEO is the crowning achievement on a nursing career spanning 40 years. Her commitment to the NCSBN core values, mission and vision leaves the organization in a strong position to continue influencing national and international nursing regulation. Mildred Schmidt helped found NCSBN, was appointed the organization's first Secretary-Treasurer and also served as president from 1979 to 1981. She is recognized for her pioneering vision, steadfast leadership and unwavering support.